I write a lot of AVR programs and at times I need to debug the code. I use EasyAVR v7 development board. It doesn't have ICD support. Please provide ATMEL ICE and AVR ONE debugger connectors on EasyAVR v8 so that we can use other compilers other than mikroC PRO AVR with EasyAVR v8 development board and also we can debug the projects. Thank you for your suggestion regarding to the next generation of our board. I will forward this idea to our Development team. I was able to connect Atmel ICE programmer/debugger to EasyAVR v7 using the onboard JTAG connector and I successfully programmed and debugged ATMega1284 using Atmel Studio 6.2 and IAR EW AVR 6.60.1. Until we do not implement connector for external the programmer in new generations i suggest you to share how did you program your ATMega1284. Also some pictures will be desirable how did you make this. This will be very helpful for some users which want to use external programmer on this board. I will soon post how I used Atmel ICE with EasyAVR v7 and IAR EW AVR Compiler. I will also post the simple LED Blink project written for IAR EW AVR Compiler which I used for Programming and debugging. Ok. Here I explain how to use Atmel ICE with IAR EW AVR and EasyAVR v7 for Programming and debugging. Buy the Atmel ICE full kit. It comes with Atmel ICE AVR to JTAG adapter board. Connect Atmel ICE to this adapter and plug the JTAG connector to the JTAG connector on EasyAVR v7 board. On adapter board pin one of JTAG connector is marked with a dot and on EasyAVR v7 with a pointer. Now plug the Atmel ICE to PC using USB cable and then connect external power supply to EasyAVR v7 board and switch ON the power. Open IAR EW AVR project attached in IAR EW AVR 6.60.1 Compiler. If you want to program or debug the chip say ATMega1284 of EasyAVR v7 then first you have to use the EasyAVR v7 board with its onboard mikroProg and AVR Flash software and write a dummy .hex file with JTAG fuse set. Only then you can connect with Atmel ICE else it will not work. Now after opening the IAR EW AVR project if you want to program the chip then build the project for Release and then choose Project > Download > Download active application. If you want to debug then choose the Debug type and not the RELEASE type and then build the project. Now choose Project > Download and debug. This will open the window shown in the image. You can place the cursor either in c code view or asm code view and debug the respective codes using F10 and F11. If you have already downloaded and want to restart the debugging then you can choose Project > Debug without Downloading. I have found that you can directly connect the Atmel ICE to the board without needing JTAG capability on chip. JTAG is not available on all Atmel AVR MCUs. There is not an available header for the ICSP, but you don't need one. You just have to connect it manually to the correct pins on the dev board. It's a bit of a rats nest if you don't have a custom cable, but it can be done with some simple jumpers. 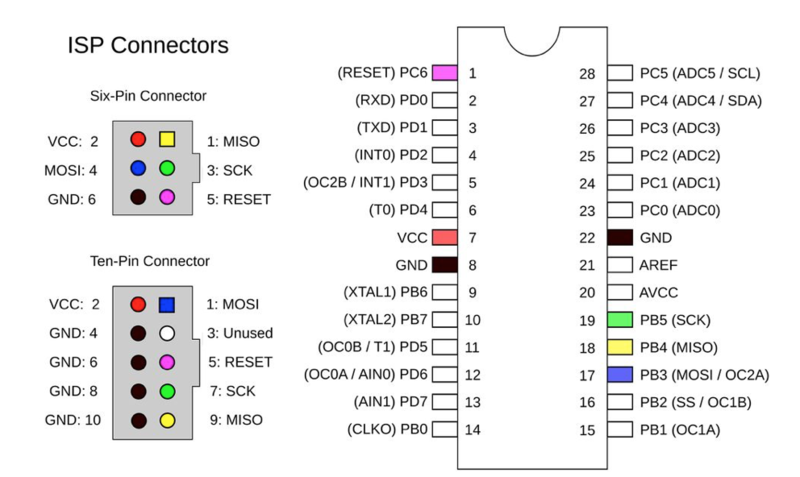 Below is the pinout for the ICSP connector, as well as the ATMEGA168 for reference. One thing to note is that the on board programmer must be powered up for this to work. These pins are not directly connected to the MCU. The ICSP bus flows through this programmer and it seems to act as a transceiver of sorts. The reset line must be also be tied via the correct jumper to the headers so that it can be accessed by the ICE. No different than connecting the ICE to a chip on a breadboard. Not what I wanted from a purpose built dev board, but a work around none-the-less if you need access to DebugWIRE.